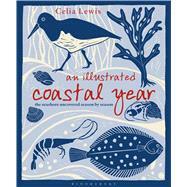 Written and presented in the same style as 2013's popular An Illustrated Country Year, Celia Lewis's beautiful new book covers the wildlife found on and around the seashore, above and underwater. Illustrated throughout with Celia's gorgeous watercolors and linocuts, the book is broken up into seasons, each featuring illustrations of flowers, insects, animals, fish, birds, shells, and all sea-related species found during that time of year. Celia's insight provides an enchanting new way to explore the coasts of the United Kingdom and northern Europe. Within each season are sections on what you might see or pick up during a walk along the tideline or along a coastal path, as well as tips for what to look out for and how to forage with using what you might find. Also included are inspiring craft projects suitable for all ages and tasty recipes by some of the best seafood chefs. Other sections include What's Flowering (wild flowers and grasses), How-Tos (e.g. how to read a tide table, how to recognize cloud formations), What's the Difference? (e.g. gulls, flat fish, etc. ), and What's This? (identification guides for beachcombed items, such as mermaid's purse, etc). An Illustrated Coastal Year highlights all the flora and fauna to look for when you visit the coast and is perfect to dip into before or after any trip to the seashore. Celia Lewis has always taken a great interest in nature. She delights in observing the passing year and recording her sightings in her artwork. Celia has won several prizes for her art and is the author and illustrator of An Illustrated Country Year, as well as the beautiful Illustrated Guide series of books on choosing and keeping chickens, pigs, cows, ducks, and geese.